I'm not a race person. I don't look at race. . . You're the one who seems to care about race— Roberta, the 70-year-old Hillcrest prep school administrator whose association with the school goes back to the days her father taught there. Her defensive comment is prompted by the complaint of Sherri, the Head of Admissions , that for minority students financially able to choose private over public education, the catalogue's photos (for which Roberta is responsible) must better reflect the school's racial diversity. Let's agree to disagree about that, OK .— Sherri, who's spent her 15-year tenure at Hillcrest passionately and insistently working to undo the old school, all white establishment system, in response to Roberta's implication that her pursuit of diversity makes for excessive attention to the color of someone's skin. Like Catcher in the Rye's Holden Caulfield, Charlie Luther Mason (Ben Edelman) of Joshua Harmon's Admission is a student at a private prep school who sees himself surrounded by phonies. Unlike Holden, Charlie is a well-adjusted, super-achiever. True to the middle name he's in tune with his parents (Jessica Hecht and Andrew Garman) liberalism — that is, until he and his multi-racial best friend Perry (unseen on stage, as is his black father) apply for admission to Yale, and Charlie wait-listed while Perry is accepted even though his credentials were not quite on a par with his. That's when he goes into meltdown mode and, like Holden, sees his world full of phonies — which ultimately includes his parents. 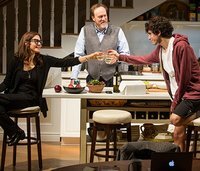 Harmon has structured his play to pivot around the effects of that Yale admission office's decision on Charlie and his parents. While Salinger sent Holden on a journey from his Pennsylvania prep school to New York, Harmon keeps the action in the Mason home and Sherri's office. Charlie's journey, which takes him from rage, to sullen sticktoitiveness to surprising transformation, serves as Admissions' dramatic arc. Though intermissionless, the play actually function as if it had three acts. The structural duality of a 3-act play within a one-acter, is mirrored by the title's double meaning. Its most obvious meaning refers to the factors influencing the executives in charge of admissions at Yale and Hillcrest that activate the plot. But the play is also very much about the feelings admitted to in the aftermath of the Yale decsion about Charlie and Perry. The three acts, here called parts, cover a period from December to April. Part One establishes the school as a place which, thanks to Sherri's hard work has increased its percentage of students of color from 5 to 20%. In her interchange with Roberta (Ann McDonough), the old-timer responsible for the admissions catalogue that's quoted at the top of this review, we see Sherri as a take no prisoners administrator. But once the action moves to her home we see a somewhat different Sherri: An anxious, caring mother for whom Charlie's shockingly hostile speech resonates as a cry of pain, whereas her husband (Andrew Garman) rebuts his son's outrageous speech with his own angry condemnation. The second and third parts see Charlie still in school though no longer the happy camper he once was, only to finally emerge with a surprising new mindset results in an explosive parent-child battle that isn't a real win for anyone. Of course, there's an immediately apparent bit of hypocrisy in the Masons' story that's designed to hit home with this audience. After all many of them are New Yorkers who tend to support liberal causes yet send their kids either to private schools or the few public ones that still have reasonably sized classes and a large percentage of white pupils. For the Masons the main reason they opted to work for an exclusive institution that, even when more diversified, will keep s the balance from tipping towards a non-white majority was that it would give the son whose name includes a tribute to Martin Luther King the benefit of the kind of a high quality education more available in an exclusive than inclusive setting. In Sherri's case, her placing as high a value on a Yale acceptance as Charlie puts that interchange with Roberta Of course, there's an immediately apparent bit of hypocrisy in the Masons' story that's designed to hit home with this audience. After all many of them are New Yorkers who tend to support liberal causes yet send their kids either to private schools or the few public ones that still have reasonably sized classes and a large percentage of white pupils. Ann McDonough she's also the funniest, once again demonstrating Harmon's gift for pungent contemporary comedies with well-crafted modern characters and memorable soliloquies with Bad Jews and Significant Other. But Admissions is not just another amusing look at contemporary life but an issue heavy play in which gender and class as well as race figure importantly. Omitting Perry and his black father from the cast, but including Ginny (Sally Murphy), the white wife and mother, is obviously intended to underscore the play's #1 issue: Private schools may have more people of color than they once did but liberals like the Masons still often don't really see and understand them or know how to align their beliefs and actions. Thus the play's focus on the white characters' reaction to Yale's decision about which Hillcrester to accept. Sharp and smartly pointed as Mr. Harmon's dialogue is, the play's long speeches are rather self-indulgent, his characters overly convenient stand-ins for the issues that inspired the play. Fortunately Director Daniel Aukin's , production helps us buy into a set-up that's unlikely to play out this way in real life. nandez set perfectly echoes Mr. Harmon's larger than life dramatics. Most importantly, there's the cast who turn everyone into understandable human beings. Jessica Hecht is especially impressive in conveying the difficulties of aligning her very worthy ideals with the intense love of a mother for her only child. Ben Edelman awes with his delivery of his mile-long, obnoxiously contentious initial speech and the more high-minded later one; enough so that has us looking for ways to see people like Charlie and his parents bring the American Dream back into the mainstream. Admissions may not have the depth to become the theater's most incisive dramatization of the factors that have re-segregated so much of America. But bravo, Lincoln Center Theater for presenting plays like Admissions and last year's Pipeline that look at these problems from different perspectives. Cast: Ben Edelman (Charlie), Andrew Garman (Bill), Jessica Hecht (Sherri Rosen-Mason),Ann McDonough (Roberta), Sally Murphy (Ginnie).